As Audio Director at Atlanta’s North Point Community Church, David Stagl is an expert at meeting the exceptional challenges posed by the fast-paced field of sound for worship. In this exclusive interview, David sheds light on the unique needs of live mixing for the religious sector, from sound reinforcement and recording to real-time online streaming and broadcast. Which console do you use? A 96-input Avid Venue Profile. I've been mixing primarily on the Avid Venue for about seven years now and use Pro Tools for anything else. What live mixing challenges do you feel are unique to the church environment? I think that one of the greatest challenges mixing in a church environment lies in the wide variety of programming a mixer often needs to deal with. One minute you might be mixing a rock band and the next you're mixing something considered more traditional "church,” then there are dramas and videos and preaching. A great HOW (house of worship) mixer needs to put it all together and smoothly navigate the transitions between all these elements while still handling the unique challenges each presents. Our typical services have a dynamic range of 30-40 dB, and it can be challenging to make that feel natural to a listener. On top of that, the "audience" can be a very wide demographic with varied personal tastes, and I think this really drives the need for audio to be of the highest possible quality. I think people are much more tolerant of music styles outside their tastes as long as it's done well and sounds great. How do you approach your mix in the house of worship setting? I look at each element in the service and focus on maximizing clarity and impact. If it's music, I am thinking about the sound of the band that week and making adjustments for what each song needs in order to deliver its message and emotion. If it's spoken word, I try to make everything as clear and natural as possible. Then I think about how I'm going to move through it all to create a natural sonic flow without drawing attention to what I'm doing. I really want to direct the listener's focus to what's happening on stage. What opportunities and challenges do you feel are unique to your work as FOH in a HOW? Mixing in a house of worship provides a great opportunity to mix constantly changing programming and musical styles while still maintaining consistency from week to week. I might have some of the same musicians, but I get to mix a new band just about every week. This is also a challenge because the bands don't necessarily have a sonic "band" identity, so there can be added pressure on the mixer to figure that out and translate it for the listeners. Onboard processing on a console can be great, but you're typically limited to one or two styles. Veteran live and studio engineers all discover sooner or later that different things work better at times than others, and that plugins provide added flexibility that the console alone can't. 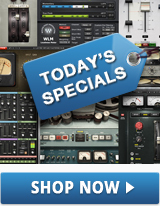 Plugins offer a digital equivalent to the diversity of analog outboard gear that we've had for years. In addition, plugins offer processing that often goes beyond the stock offerings of a console. For example, I have yet to see a console come to market with a processor that works like Bass Rider. What are some of the advantages of Waves plugins? Waves plugins offer me a creative palette that cost and space rarely allowed in the analog days. I find them freeing, because I don’t have to worry about whether I have the right tool or enough of them in the rack anymore. During sound-checks, I can just build the mix and when I hear something I need to address with processing, I’m a couple clicks away from the right tool. Do you use volunteers to mix services? If so, how do you incorporate using plugins with their training? I oversee a team of about two dozen audio volunteers, and we definitely utilize them for mixing. In training, I treat plugins the same way we would treat outboard gear back in our analog days; I'll show them what it does and how we can utilize it, and then I set them loose to learn the intricacies of working with it. There's no substitute for giving someone hands-on training. I'm a big fan of the CLA Classic Compressors. I also love H-Comp, which is a very powerful and flexible compressor with its Punch and Wet/Dry controls for doing parallel compression right on an input or output bus. C4 is probably my secret weapon these days. Bass Rider has also changed the way I handle bass. My typical vocal chain is a Crane Song Phoenix for color into the Waves Renaissance Channel for EQ and compression, followed by a Serato Dynamic EQ for de-essing, and then the icing on the cake is the Waves C4. I start a mix with everything bypassed and then turn things on as needed. Renaissance Channel does the bulk of the work for me right now and is my channel strip for vocals. I tried it out on a whim, and thought the EQ did a really good job of cleaning the vocal up without having to do a lot of EQ surgery I was doing with some other stuff. I also like the Renaissance Vox compression setting because it's pretty transparent and smooth. Sometimes I'll also use the expander on BGVs (background vocals) and focus the internal sidechain frequency on the vocal so it only opens when they sing. We don't typically have a drum shield up, so I set the floor of the expander down maybe 6-10 dB to clean up some of the stage wash from the drums so I don't have to ride BGV mics when they're not in use. Following Renaissance Channel, I also use C4 a lot. Sometimes a vocalist will have a couple of notes they'll hit that just have a weird resonance in them, where using an EQ to fix them can actually hurt their tone for everything else. C4 is my final vocal mastering plugin and can be used to smooth those problem areas out. It also works great as an EQ for really broad, final tone shaping by playing with the gains on each band. Sometimes I'll just set C4 to tickle the compression on the two mid-bands a bit, which can work as an alternative to boosting up top to try and bring out some "air" on the vocal. How do you control the lead vocal using Waves plugins? How much control I might need depends on the singer, but I'll typically start with the Renaissance Vox compressor setting in Renaissance Channel doing maybe 3-6 dB of compression on a louder section of a song, depending on how overly dynamic he is. If Renaissance Channel doesn't feel like it's the right tool, I might try a CLA-2A. Sometimes I go for a CLA-76 Bluey if I want something a little more aggressive. Sometimes, if I have a singer who gets a little "shouty," I might even turn on the console comp in addition and use it to catch the peaks so that my Waves stuff can handle the bulk of the leveling. Then, I typically double-bus the vocal to the L/R, and a Group feeding the L/R. On the Group, I'll put another compressor, which is typically the standalone Renaissance Vox or CLA-3A these days, and I'll set it to compress probably at least 6 dB or more. I’ve also started using a trick here that Lee Fields showed me with the CLA-76 Bluey using the All Buttons mode. Then I can feather that Group into the mix, which can give the benefits of compression to help the vocal sit on top without giving it a compressed sound. You just need to be careful with this in a live setting, because every bit of compression on a vocal can increase the stage bleed in the mic and decrease gain before feedback. Which plugins do you use for drums? I always have the CLA-76 Blacky on my top snare mic, which is a Beta 57. Even when it’s not compressing much, it adds a very familiar character that I love to the snare. Renaissance Bass can help beef up my toms when using smaller diaphragm mics. I finish things off with H-Comp on a parallel buss of kick, snare, and toms doing about 3-6 dB of compression, which helps thicken up the drums and gives them added punch. Bass Rider is my main tool for leveling the bass out. Next I’ll usually hit a compressor to get a little more level control, some added sustain, and a bit of character to help cut in the mix. If I have a boomier bass with too much bottom end, the CLA-3A can help tone that down a bit. Otherwise, I’ll lean towards a CLA-76 Blacky. I go back and forth on compressing electrics but, when I do, I like Renaissance Axx to thicken electrics a bit while also bringing out any subtleties I may be losing in the mix. I also run the guitars through a buss and use the Kramer Master Tape on 7.5 IPS to give the upper-mids a subtle bump while taming the extreme highs I don’t need from guitars. C4 is a great problem solver for keyboardists with multiple-patch disorder. Once I fit the keys in the mix, I rely on C4 to keep them in their space in the event of extreme tonal swings in patches. It can really help keep any “sizzle-y,” virus sounding stuff from cooking our guests. Lately I've been using the Kramer Master Tape. The only thing you have to be careful with is since Waves did such an accurate modeling of the original hardware, there's an 8K ring that can be apparent in quiet moments on a high-fidelity PA. I also like to have a C4 ready to go on the main mix bus. Our ears get more sensitive to upper-mid frequencies as volume increases, so I have a setting for the C4 that will smooth that out if we want to lean into the PA. It helps maintain a smooth spectral balance of the mix and keeps things from getting harsh and painful. Please describe your signal chain, from the stage mics out to the FOH speakers. I start by trying to get the right mic on the source and then spend time getting mics optimally positioned especially on drums and guitar amps, where half an inch can change your world. Our mics hit a three-way isolated split that goes to FOH, monitors, and our studio for online broadcast. If the source is right and the mic is right – and I think it still needs something – I typically EQ first. I'll use the console EQs a lot for general inputs, but for important stuff like vocals I'll typically reach for something like the Renaissance EQ. The same goes for compressors. I love the black CLA Classic comp along with the Renaissance stuff. You just have to be careful, though, with comps like Renaissance Axx or Renaissance Vox in a live setting because the auto-makeup gain can get you in trouble with feedback and headroom. A trick in setting these is to use two encoders on the console to turn the Threshold and Gain down simultaneously to get the sound and control without introducing feedback. Past the input, I buss similar instruments together into groups. These make it very easy to do any broader balance changes plus I can also utilize last ditch, emergency processing this way. With so many different mics at play, sometimes it’s just faster in a combat situation to throw something like a V-EQ4 or Renaissance EQ across a group and do any subtle tweaks there. Then my console outputs feed AES signals to three Meyer Galileos that then feed the PA.
What is your favorite Waves problem-solver? C4 is my go to problem-solver. It's just great on smoothing out tonal inconsistencies. I'll use an EQ to give an input its spectral or tonal footprint in the mix, and then I can use the C4 to keep that input within the range I'd like it to sit. This can come in handy with keyboardists who like to change patches a lot. Are you recording or virtual sound-checking the services? We multi-track every service and mid-week rehearsals. After rehearsal, we utilize virtual soundcheck to refine the mix and really dial things in. It is also an incredible tool for training our volunteers. Do you stream your services? We stream our services from our studio. They use the CLA Classic Compressors quite a bit along with C4. If I'm mixing for online, I'll bring in my personal collection and add C4, H-Delay, Renaissance Reverb, Doubler, Renaissance EQ and Kramer Master Tape. It's basically the same stuff I use when I'm mixing FOH with more FX added since I don't get quite the same ambience of the venue even with added room mics. Do you mix/master the recordings yourself or do you give them to another engineer? Everything we stream is mixed live in our studio. Any content from our services beyond the online broadcast is typically mixed and mastered in-house in post. There used to be more of a distinction between live and studio engineers. Do you find that today more engineers do both? It's hard to say. The guys I look up to, who have mentored me over the years, often move between the studio and live worlds, but most of the guys in my circles these days tend to specialize in one or the other. I spent the early part of my career focused on studio and post-related work, before getting into sound reinforcement, so it feels natural to me to work in either environment. I think in the future, live sound engineers are going to need to become more familiar with the studio side of things especially in the HOW market where a trend is moving more and more towards exporting what happens on Sunday. Mixers are going to need to get educated in order to create mixes that can translate from a big room down to a living room or set of ear-buds. Do you have any unique plugin applications you’d like to share? Since the dynamic range of our services is so wide, swinging from concert level music to conversation speaking, it can be difficult to export the mix to places like hallways, video control rooms, tape, etc. I have some bussing on the console to help close the gaps along with a limiter, but inevitably we’d need to hit the limiter too hard and compromise the louder music mixes. I started using MaxxVolume last year to help level things together, and it has been a big help in reigning in and finalizing the dynamic range on my matrix feeds. I can compress the loud stuff a little bit if I want, but it really comes in handy to bring up the quiet stuff without making the mix sound overly compressed. My goal is to support our entire programming team to help create a memorable experience for our guests that makes them want to come back the next week. My goal is to help the band and talent on stage create a memorable experience for the audience. I'm the last link in the chain that puts it all together, and on my best day, nobody should notice what I'm doing. What advice could you give to other Tech or Audio Directors who want to move to digital? Take your time learning the new equipment. You're investing in gear you're probably going to have for a while, so figure out how to do everything you already knew how to do with it first. Once you've got the fundamentals down, you can start easing your way in to the deeper possibilities. It's easy to get overloaded by features, so take things one at a time and learn their intricacies before moving on to the next thing.